Back in STM town with another of their bags to take a look at. This time we're trying out one of their brand new messenger bangs, the Radial, designed to safely stow a 15” laptop, and everything else you need, all day long. Just like the Haven backpack we reviewed a few months prior, this features both STM's new power cable routing feature, and their slingtech protection. On the exterior of the bag, where you might typically find a water bottle pocket, there is a small zipped compartment. Into that you can place a fairly big portable power pack (like this one, or this one, or even this one) and thread the USB cable through the special opening. Using black cable tidy clips (which are a completely genius idea) you can direct the end of the wire where you need it, be it to the dedicated tablet pocket on the inside front of the laptop compartment (more on that later), or through to an entire different section of the bag to reach the smaller smartphone pocket. With a decent power pack kept in there, your bag is ready to charge your gadgets no matter where you are. And – crucially – it won't be a mess of tangled wires. As well as that little pocket, the STM Radial Messenger Bag features a zipped pocket on the front, and a larger zipped compartment behind that, complete with smaller pockets and sleeves, and also a key chain clip. On the very rear, next to where it bumps up against your bum, is an open document sleeve with handy cargo loops. And finally, in the middle of all of those, and under the bag's main rain flap, you'll find the largest compartment. Here you have the most space, and the slightech protection pouch for your laptop. STM say the bag can accommodate a 15” laptop, and we managed to get a 15.3” in there (albeit snugly) too. The padding actually takes up quite a bit of room in the compartment, and it's easy to feel the thickness of it at the bottom edges. It's very reassuring to know that, even if you dropped your bag from shoulder height, there is a good chance the padding will save your computer. Still with your laptop in there, and then an iPad as well, you aren't going to get much else in there but a jumper, your laptop power wire, and maybe your lunch box. If you aren't greedy. 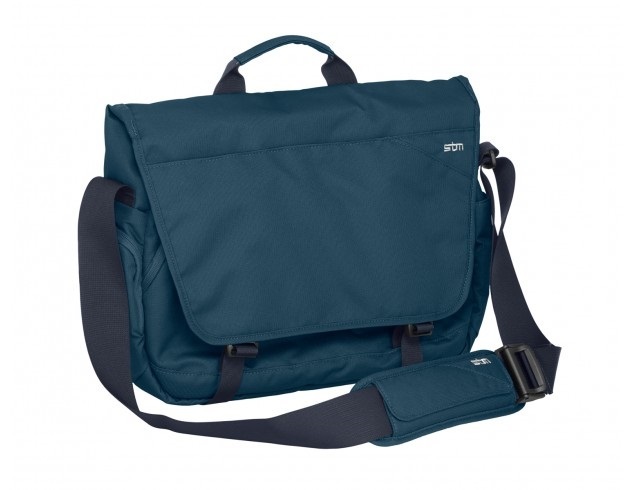 Because of that the STM Radial Messenger Bag makes the perfect day bag and commuter carry. Everything has been geared toward keeping your gadgets safe, protected, and charged, while making the aesthetics smart and the general unit comfortable to wear. Another winner from the Aussies.